After some years of contemplating a fully automated replacement for the manual system, ABB Aust. contacted SN2 in June 2007. A feasibility study, reports on design alternatives and a series of conceptual designs followed. With the project pace speeding up and increasing confidence developing, ABB employed Brett Alexander to manage the project. Now Dr Alexander, Brett was at that time nearing the end of his PhD in chemical engineering. SN2 did the conceptual design and much of the detailed design for ABB following design constraints provided by ABB. 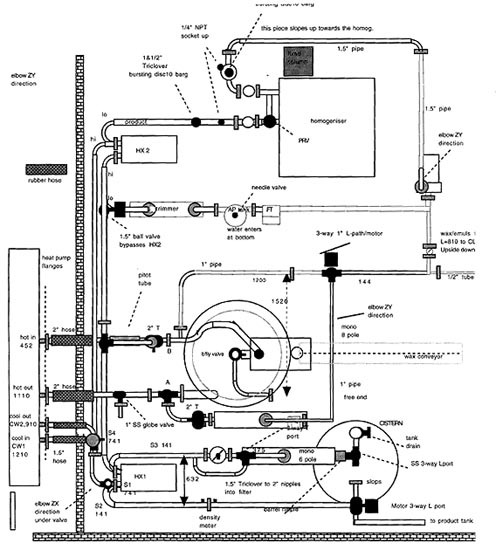 This included: designing and revising the process flow diagram, design of the control loops, calculations of equations of state and selection of equipment (compressor, valves, instruments, materials of construction etc. ), HAZOP and assisting the PLC programming as well a solving the unique problems that arise with any new project. Dr. Wayne Davies designed and headed a team that built a plant for the production of a special wax emulsion in the period October 1995 to August 1997. The plant was exported and commissioned for a concrete company in Hong Kong who used the emulsion as an additive for high-strength concrete. The plant was built in Sydney, exported and commissioned for a concrete company in Hong Kong who used the emulsion as an additive for high-strength concrete. Its capacity was 100 tonnes per day. SN2 managed the entire project from primary research, costing, study of alternatives, P and IDs, equipment specification both mechanical and electrical, scaled piping plan, control scheme, handover and commissioning. Research focused on the only major unknown, which was the rate of melting of wax pieces under defined conditions of agitation and temperature. This work showed that particle surface area and temperature difference were the important parameters. A control scheme involving ratio and "inverted" cascade control was developed to meter the liquid streams: water, liquid wax and emulsifier into a high-pressure homogeniser. Head pressure on a "balance tank" feeding the homogeniser was used to set the flowrate of incoming water, the value of which was proportioned and sent as set points to the other control loops for wax and emulsifier. The controller used for commissioning was a multiloop three-term control package written in-house that ran on a Macintosh computer using ADAM© modules. The plant was highly energy efficient and suitably compact. At 100 tonnes per day, it had the highest capacity of any such plant in the world. The plant was commissioned with a run of 225 tonnes (see Chemical Engineering in Australia Spring edition 1997). 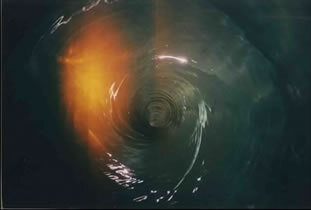 Vertical view of vortex in hydrocyclone wax melting tank using water. A horizontal acrylic plate, referred to as a vortex bearing was placed immediately below the liquid level in order to prevent air from funneling down and entering the pump beneath the tank. In operation, the hydrocylone was fed with wax lumps that remained at the tank wall until melted. Thus only liquid wax entered the pump. This plant was designed for research into commercial applications of supercritical extractions and reactions. The plant was designed in May 2003 and was commissioned with its first run in October that year. The plant features pressures to 250 bar at 4 litres/hour and temperatures to 400 deg C. Operation is under computer control and there is extensive data logging of key parameters. The plant is currently being used to examine a number of reaction schemes in development: (i) a special process for converting a wastesteam to a useful product, (ii) transesterification and esterification reactions used to make biodiesel and (iii) methanolysis of organics such as lignite and plastics wastes, (iv) dechlorination of organochlorines such as dichloroethane and vinyl chloride monomer. The dechlorination processes being studied remove chlorines in a totally aqueous system that is completely sealed. The St Marys Aquatic Centre is an extensive regional swimming centre based around a large indoor pool and spa. In the original design there was single supply of hot water for both spa and pool. All of the hot water flowed firstly into the spa and this then overflowed into the main pool. As a result spa and pool temperatures were not simultaneously controllable. The desired spa temperature was 37 to 39 deg C and the pool temperature about 10 deg less than this. In summer the pool temperature tended to climb well into the 30s while in winter the spa tended to be too cold. In addition the heat pump that supplied the hot water was running under stressful conditions that were causing it to fail too frequently. Dr Wayne Davies was asked to design a new system so that both spa and pool temperatures could beindependently controlled. Preferably this was to be done without creating a separate watersystem for the spa as the cost of a complete treatment plant was expected to be excessive. To do this a large heat exchanger took the outflow from the spa and used this stream's heat to preheat the cooler incoming spa water. A smaller gas-fired heat exchanger added the extra heat to bring the spa up to its temperature set point. Dr Wayne Davies did the overall design, the control system and the electric circuits as well as supervising the contractors. The new system has been running since March 2000 and has resulted in reliable control of spa and pool temperatures as well as taking stress from the heat pump that supplies the hot water. The project came in on budget and on time. The ATWS is a plant for removing volatile organic compounds (VOCs) and other pollutants, both oil and water-soluble, from waste air streams. It is especially suitable for fumes arising from mixed hazardous wastes where the composition and concentration is highly variable. The ATWS works by contacting waste air with an aqueous scrubbing liquor at below-zero temperatures. This is carried out in a packed column under countercurrent flow. Direct contact of waste air with the ice-cold scrubbing liquor chills the air rapidly causing the VOCs to condense and to form a separate organic phase. Depending on their water-solubility, some VOCs dissolve directly in the aqueous scrubbing liquor while others dissolve in the separate oily phase. Up to 90% of VOCs and other fumes are removed as a liquid which is combined with other liquid wastes for disposal. The ATWS is ideally placed before activated carbon (AC) absorbers which polish the air released to atmosphere. In this way the majority of VOCs are removed without burdening the expensive AC. 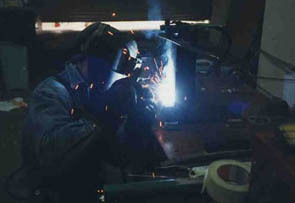 Water-soluble fumes that are not absorbed well by AC, are largely removed as well. ATWS has been in active use in a waste transfer plant in Dunheved NSW since 1995 where it separates out some 10 to 15 litre per day of mixed condensate. The ATWS has been approved by the NSW EPA.